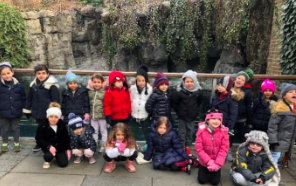 Pre-K Yarok Visits The Central Park Zoo! Pre-K Yarok has been studying their favorite animals. In order to see them first hand, students went on a field trip to the Central Park Zoo! What a fun trip it was! First, the children followed the maps (that they made themselves!) to see the sea lions -- which were swimming around and around! Then they saw the penguins being fed - they ate a lot of fish! The beautiful snow leopard came over to look at the group which was also very exciting! The children warmed up in the Tropic Zone where they saw ducks, parrots, snakes, lemurs, and a beautiful peacock walking right next to them. They also saw a bat hanging upside down from a tree, as well as snow monkeys with their red faces! Later on, the class decided to have their "Choice Time" dedicated to turning their classroom into a "zoo." First, students made a list of things they would need, including: animals, zookeepers, maps, tickets, map distributors, a photographer, a gift shop, and different habitats for the animals. Then, the children used model magic to shape animals, paper to cut out and make tickets and maps, and plaster, water, and recyclables to build hot and cold habitats! The children also used wooden blocks and Magna Tiles to help build habitats for our zoo animals. Following their building, students worked collaboratively to write books for the classroom's "zoo gift shop." First, they voted on an animal to research. Then they went to the library and Mrs. Peters helped them gather information about the specific animal they chose. Afterwards, each child wrote a sentence for the book and illustrated a page! The class is excited to continue their exploration of animals!